Photographed on Triquet Island off the central coast of British Columbia. 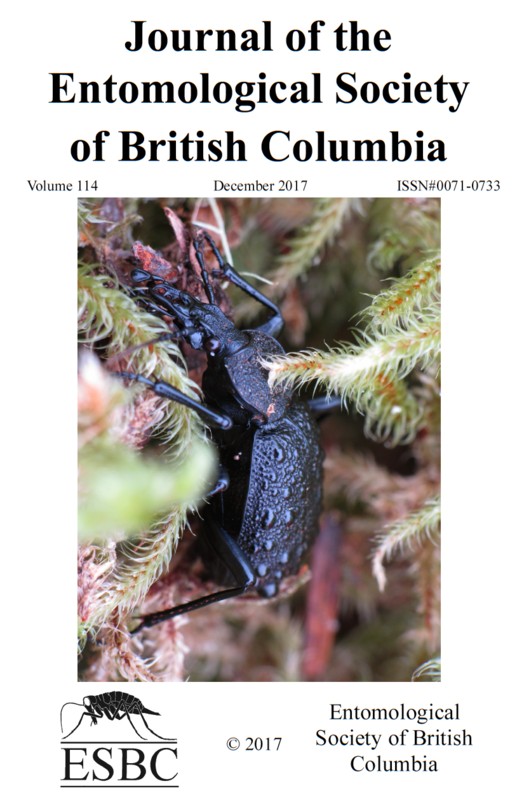 This rare woodland beetle slowly meandered through the mossy understory of a cedar forest, unaware of the 14,000-year-old Heiltsuk village hidden in the earth beneath its feet. Photograph by Crystal Ernst, Hakai Institute/Simon Fraser University. Canon PowerShot SX10 IS, with Raynox DCR-250 clip-on macro lens, f/4.5, exposure 1/40, ISO 200, natural light. Photographed on the UBC-O campus on a cold morning against a concrete retaining wall in the centre of the campus, by the fountain. Photograph by Robert Lalonde, University of British Columbia – Okanagan. The background is a concrete retaining wall in the centre of the campus, by the fountain. Canon Digital Rebel T2i; 100mm macro lens; no flash; f8 in aperture mode; shutter speed unknown. Freshly-laid eggs of Leptoglossus occidentalis, showing intricate surface details and the opercula through which the nymphs emerge. Photo taken with a Nikon D90 mounted on a Leica stereozoom microscope, stack of 43 focus-bracketed images stitched with Helicon Focus software. 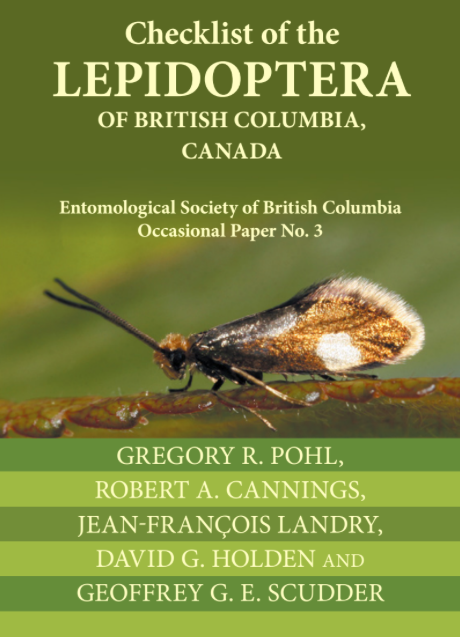 Checklist of the Lepidoptera of British Columbia, Canada. Ammophila sp. wasps on their nighttime perch, McDonald Beach, Richmond BC. July 24, 2014. These wasps spend the night in aggregations, clinging to vegetation with their mandibles. Photograph details: Photograph made by Sean McCann using a Canon 100mm macro lens and a Canon 60D. ISO 320;1/160th; single diffused flash above and to left with a bounce card. A female Agapostemon (probably texanus) gathers nectar from a diffuse knapweed flowerhead. Halictine bees run that gamut from true eusociality to solitary nesters and are as such an excellent system for studying the evolution of hymenopteran social behaviour. Agapostemon species can be communal nesters, but A. texanus as a species seems to be pretty steadfastly solitary in its habits. Like other ground nesting bees, it has an annual life cycle where overwintering females emerge in the warm part of the spring, build vertical burrows in soil and provision individual eggs with a pollen ball to support larval development all the way through to pupation. Males become abundant in late summer and fall and mated females will overwinter in diapause to start the cycle over the following year. Unlike the bee, which is native, diffuse knapweed is an invasive pest in western rangelands. Photograph by Robert Lalonde (UBC Okanagan). Made with a Canon EOS digital rebel T2i equipped with a Canon 100mm f2.8 macro lens in natural light; ISO 800; f8 at 1/250 sec; on 8 July 2013 at 1557h on the UBC Okanagan campus in Kelowna, British Columbia. The yellow-faced bumble bee, Bombus vosnesenskii, is found across large areas of western North America. Like many other native pollinators in North America, it faces threats due tohabitat loss and pesticide usage. However, unlike many other native bumblebees, its range seems to be currently expanding in some areas. 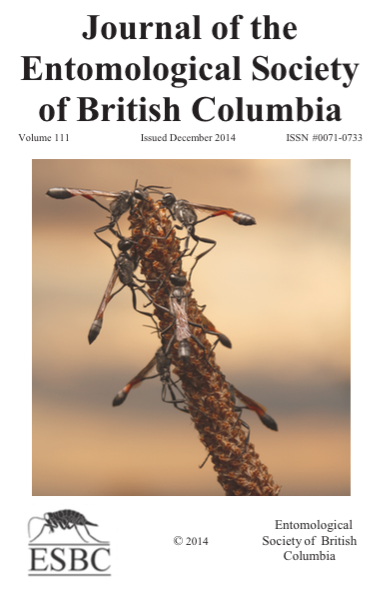 On page 31 of this issue of the Journal of the Entomological Society of British Columbia, David F. Fraser and his co-authors document this species' range expansion in southern British Columbia. The news is not all good. 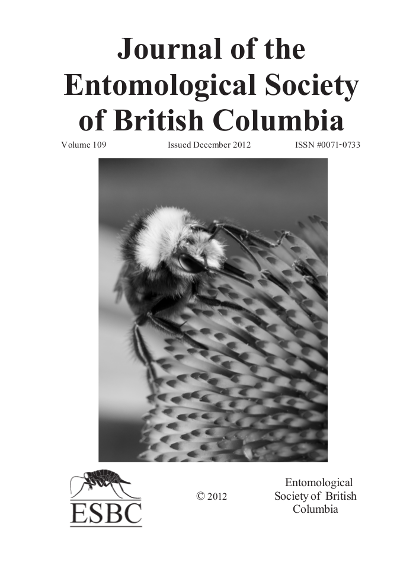 The expansion of the yellow-faced bumblebee may be occurring dueto declines in populations of the western bumble bee, Bombus occidentalis. Sean McCann photographed this yellow-faced bumble bee worker foragingon Echinacea purpurea growing in a local community garden in Pandora Park, Vancouver, British Columbia. The flowers planted there attract many insects that would not ordinarily be abundant in the area. Technical details: Canon 60D; f/11; 100 mm; ISO 200; lit with two diffused off-camera flashes. This 3-mm wasp is drilling with her ovipositor into a developing spruce cone which has beeninfested by the galling midge Kaltenbachiola rachiphaga (Diptera: Cecidomyiidae). Her larvae will parasitize the midge larvae, providing a measure of biological control against thececidomyiid. Photograph details: Cover image by Ward Strong. Kalamalka Seed Orchards, Vernon, BC. 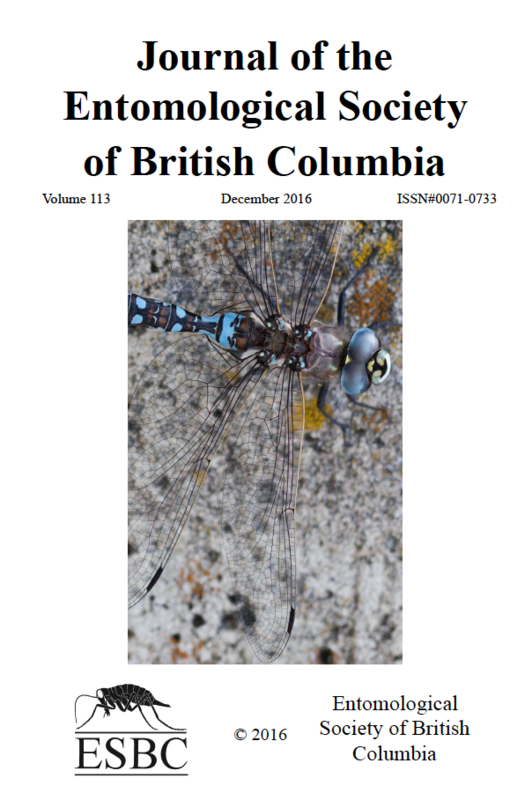 Aeshna interrupta (Variable Darner) is one of the most common large dragonflies in British Columbia. It is a boreal species, ranging across North America from Newfoundland to Alaska and south in the western mountains to California and New Mexico. It lives in marshes and peatlands and is the typical Aeshna of grassland ponds and lakes in the Interior. On the Coast it is one of the predominant dragonflies in peat bogs. The scientific name "interrupta" refers to the shape of the stripes on the sides of the thorax. In eastern North America and on the Pacific coast, these are "interrupted", that is, each is broken into two spots. On the Great Plains and in the BC Interior, the stripes are unbroken but thinner than in any other species. The common name "variable" describes these stripes. The stripes and spots of the male are blue; those of the female are blue or, more commonly, yellow. Most dragonflies spend the majority of their lives in the aquatic larval (nymphal) stage. After about 10 to 14 moults, depending on the species and environmental conditions, the fully grown larva metamorphoses into an adult inside its last larval skin, then crawls out of the water. Now exposed to air, the dragonfly begins its final moult -- the top of the thorax splits open and the adult squeezes out. It pumps blood into its wings and abdomen, which expand slowly, and gradually the body hardens. After an hour or two the dragonfly can fly, but only weakly at first. It leaves the empty larval skin, the exuvia, clinging to the support. Photograph details: Male Aeshna interrupta photographed during emergence at a grassland pond near Riske Creek, Chilcotin region, BC, 15 June 1978. Pentax Spotmatic II with 50 mm/1.4 Macro Takumar lens, handheld and with available light. Kodachrome 64 film. Robert A. Cannings. 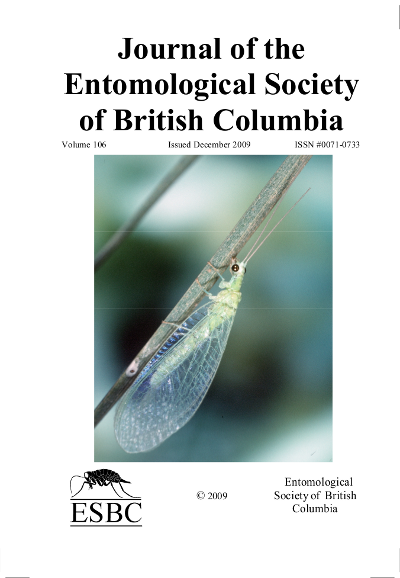 This green lacewing is common across southern British Columbia and ranges as far north as the Skeena River. With its delicate green body and golden eyes, it is one of our most beautiful insects. Seven of the ten recognized species of Chrysopa in North America occur in Canada and all of these are recorded in British Columbia. Adults and larvae are voracious predators and play an important role in the control of aphids and many other pests. Photograph details: Chrysopa nigricomis, captured at Penticton, BC in June 1982 and photographed live in a glass terrarium. Nikon F2 with 55 mm macro lens, #1 extension tube and two small strobe ﬂashes; Kodachrome 64 film. Robert A. Cannings and M. Brent Cooke, Royal BC Museum. Boreids (order Mecoptera) are interesting for two traits, they are often found wandering the surface of snow from late November until May, and they can jump. a feat they achieve using metatibial extension and resilin to store energy in the thorax before a leap. Their common name of "snow ﬂeas" is both apt and prescient, given that recent molecular studies have placed them as close relatives of the true ﬂeas. Their biology is poorly known and most texts state that both adults and larvae "live in moss". This example is a female of the species Boreus reductus (Carpenter 1933). The image was taken a few hundred metres from the junction of the Coquihalla Highway and Highway 1 at the west end of Kamloops in March 2007. An Olympus E-l DSLR with a Zuiko ZD 50mm macro lens coupled to two 25mm extension tubes was used. The magnification on the sensor (18mm x 14mm) was x1.5. This image is a crop of the original image, the length of the insect from frons to tip of ovipositor is approximately 4 mm. Lighting was with a 1980's vintage Vivitar 283 ﬂash with a homemade 10cm by 15cm cloth diffuser. The most important part of the ﬁeld equipment was a set of chest waders. 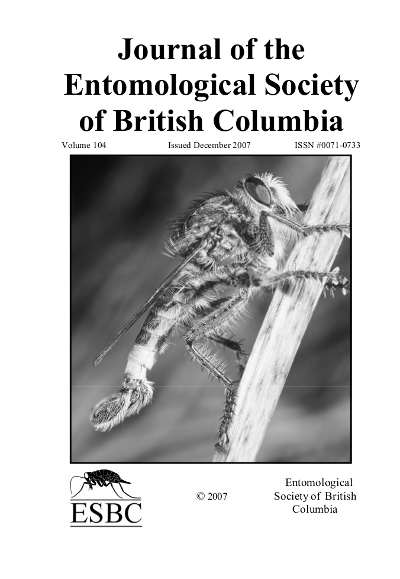 This robber fly is common in May and June in BC grasslands from the Okanagan Valleynorth to the Chilcotin Plateau. It ranges south to eastern Washington. 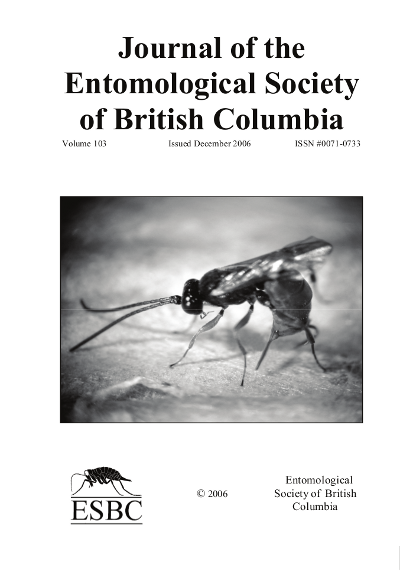 Most of the 110 North American Efferia species live in the West, where they are major invertebrate predators in aridlands; there are seven species in BC. They are easily seen and heard, buzzing about in the open, frequently perching on the ground and attacking a variety of insectsfrom beetles to damselflies. This species is about 15 mm long. The oval object on the fly’s thorax is the larva of a parasitic mite (Parasitengona). Photograph details: Male Efferia coulei, captured at Penticton, BC in June 1982 and photographed live in a glass terrarium. Nikon F2 with 55 mm macro lens, #1 extension tube and two small strobeflashes; Kodachrome 64 film. Robert A. Cannings and M. Brent Cooke, Royal BC Museum. Mastrus ridibundus was introduced into the United States from its native Kazakhstan for classical biological control of codling moth. This gregarious ectoparasitoid specializes on cocooned codling moth larvae, homing in on semiochemical cues from the silk of newly spun cocoons. Females paralyze the host and deposit between 1-7 eggs within the host cocoon. Parasitoid larvae consume the host before spinning their own cocoons within their host’s empty cocoon. Photograph details: Female Mastrus ridibundus, ovipositing in a cocoon of its host, Cydia pomonella. Photo taken with a digital camera through a dissecting microscope (16×) by Zaid Jumean, Department of Biological Sciences, Simon Fraser University. 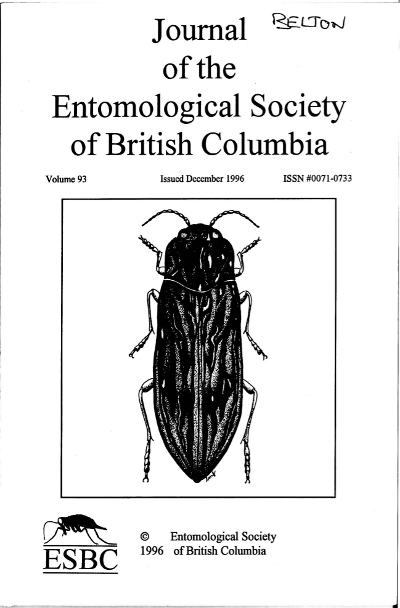 This rare western rhyparochromid bug was described as new to science in 1999 in the Journal of the New York Entomological Society 107:272-274. It occurs from British Co-lumbia south to California. 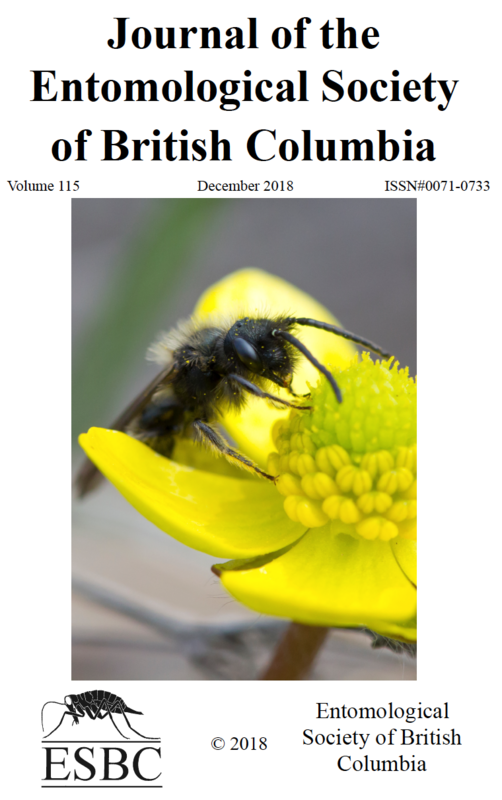 Only three specimens have ever been taken in BC, in Purshia habitat on the Osoyoos Indian Reserve near the Vincore Winery south of Vaseux Lake.This habitat was destroyed by recent fires in the Okanagan. Illustration details: Peritrichus pilosulus Scudder, male, dorsal habitus. Original pen and ink drawing onscratchboard by Launi Lucas, Department of Zoology, University of British Columbia. 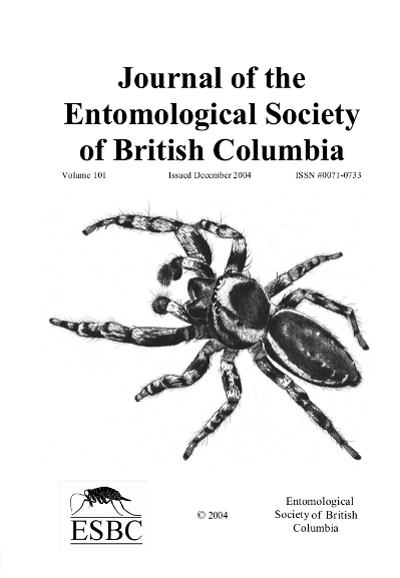 Male of Pelegrina montana (Emerton, 1981), a salticid spider common throughout Canada and extending south into the northernmost and montane United States. Known from deciduous bushes and trees associated with streams, rivers and bogs. Illustration on coquille board by pen, dark pencil and white paint. Original art by Wayne Madison, courtesy of the Museum of Comparative Zoology, Harvard University. Copyright © President and Fellows of Harvard University. 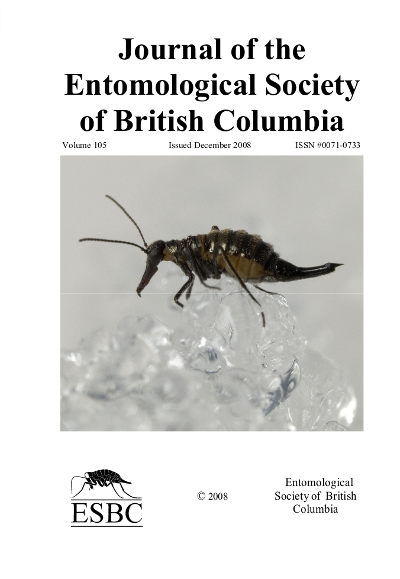 COVER: Lateral view of a male snow scorpionfly, Boreus insulanus Blades (Mecoptera:Boriedae). Adults of this species, like others in the family, are about 4 mm in length,flightless, and are active during the winter months. 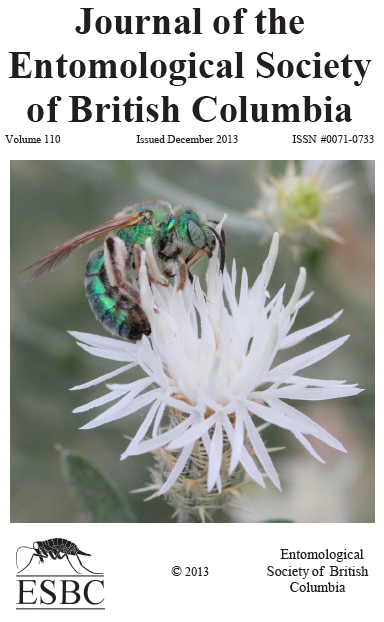 At present, Boreus insulanus is known only from 3 locations on southern Vancouver Island, suggesting that it may be an endemic species. Boreus species are found primarily in mountainous terrain, between 200 m and 2000 m elevation, throughout the Holarctic. In North America, the greatest diversity of species is inthe region from Oregon to Alaska and east to the Rocky Mountains. Original line drawing by David Blades, published in the species description in Volume 99 of the JESBC (2002). COVER: An aptemus vivipara of Myzus persicae (Sulzer) feeding on the leaf of Chinese pe-tsai, Brassica pekinensis (Loureiro) Ruprecht, 70× magnification. Scanning electron microscopy. Live green peach aphid feeding on Chinese pe-tsai leaf was transferred to an aluminum tape-rimmed SEM stub. The loaded stub and its holder were placed in the specimen chamber, viewed and pictured with a Hitachi S-500 SEM at an accelerating voltage of 15 kV under vacuum. Remark. Cho-kai Chan took this picture in 1979, and won the competition of insect photo contest during an ESBC annual general meeting in the early 1980's. The judge was SFU's renowned photographer, Mr. Ron Long. 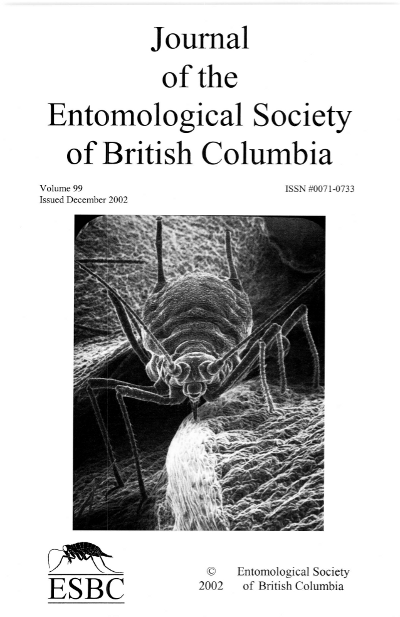 This picture was then used as a logo on the pamphlet for the Agriculture Canada Vancouver Research Station. Cover photo and text by Cho-kai Chan. 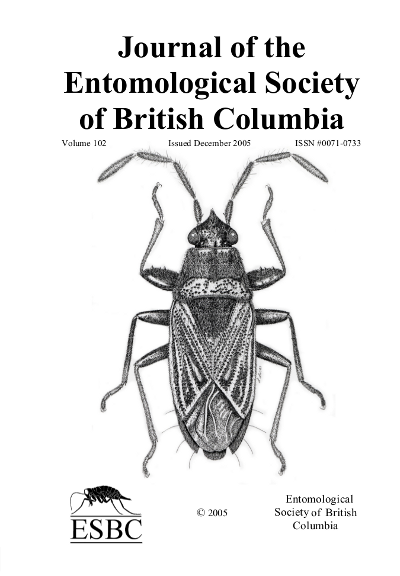 Cover: 'Beetles' is the art of Richard Hunt, Victoria BC.Richard kindly granted permission to use the design on the cover of Volume 98 of the Journal, marking the 100th anniversary of the Entomological Society of British Columbia. 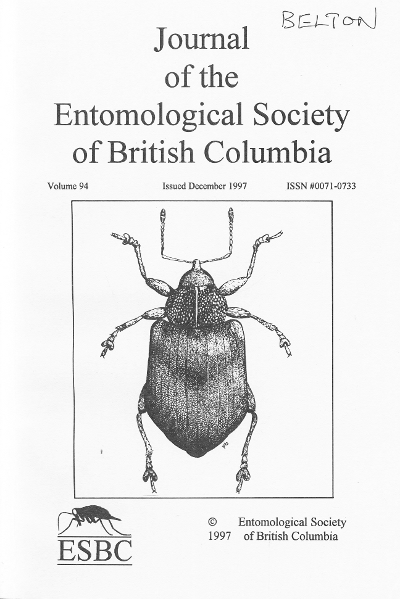 'Beetles' was the emblem for the International Congress of Entomology, Vancouver, BC, Canada, 3-9 July 1988. 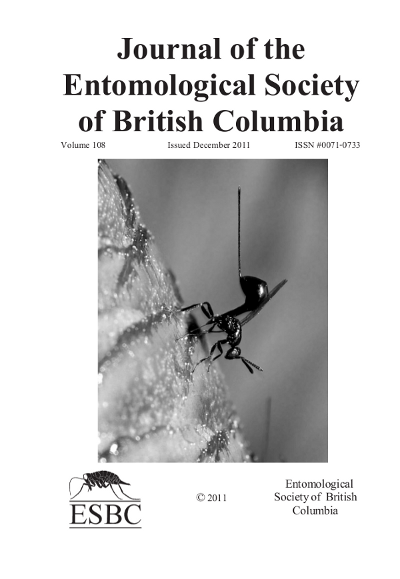 COVER: The jumping gall wasp, Neuroterus saltatorius (Edwards) (Hymenoptera: Cynipidae), was first discovered in Canada in 1986 in the Victoria area. 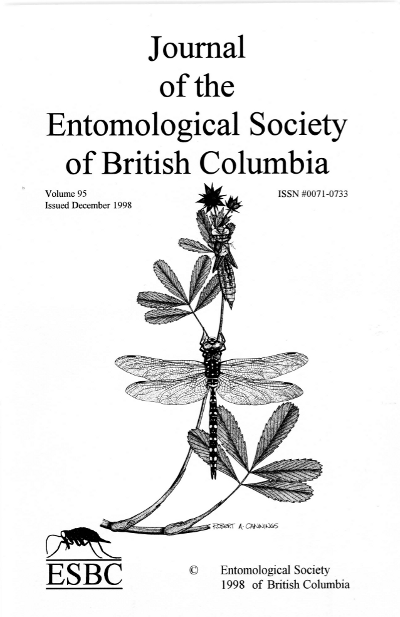 The wasp forms galls on Garry oak, Quercus garryana Douglas, British Columbia's only native oak, and has since spread to cover much of the host's distribution (primarily southeastern Vancouver Island). The insect's native range is the western United States, where it has several hosts in the white oak Family. The common name is derived from the bouncing action of tiny galls (1-1.5 mm) that fall from scorched leaves in summer, each containing an agamic female larva. 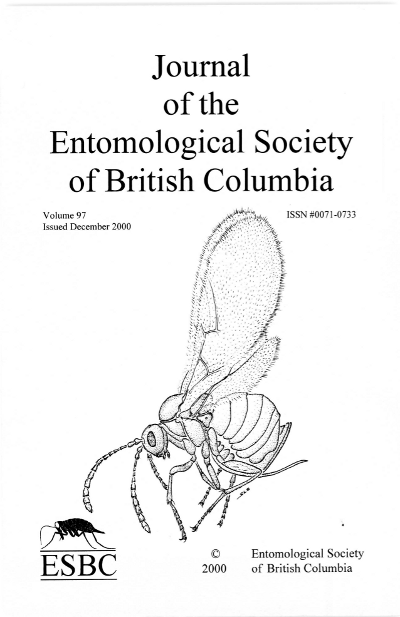 Adult illustrated on cover (body length about 1mm) and text, by Stephanie Sopow. 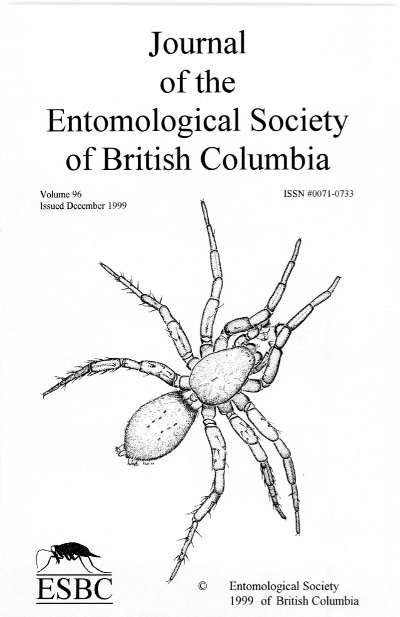 COVER: Male Gnaphosa snohomish Platnick & Shadab (Araneae, Gnaphosidae). From Burnaby, British Columbia (collected by Jim Troubridge). Drawn by Robb Bennett. Body is approximately 11 mm in length.The Holarctic genus Gnaphosa contains around 120 species of nocturnally active, ground dwelling hunting spiders. Twelve species are known in Canada with six of these occurring in British Columbia. Found in a very wide array of habitats from sea level to mountain tops and from the tropics to the arctic, specimens of Gnaphosa are often very abundant and may turn up in large numbers in pitfall traps. 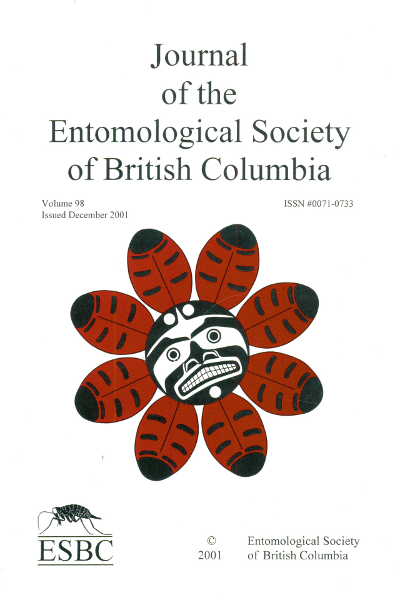 In the summer of 1998, a very strong, local population of Gnaphosa snohomish (previously known only from two specimens from Chase Lake, Snohomish County, Washington and a questionable BC record from Haney (Maple Ridge) was discovered in an abandoned cranberry bog in Burnaby, BC. The site has since been cleared and reactivated as a commercial bog and the current status of this population (and the species) is unknown. 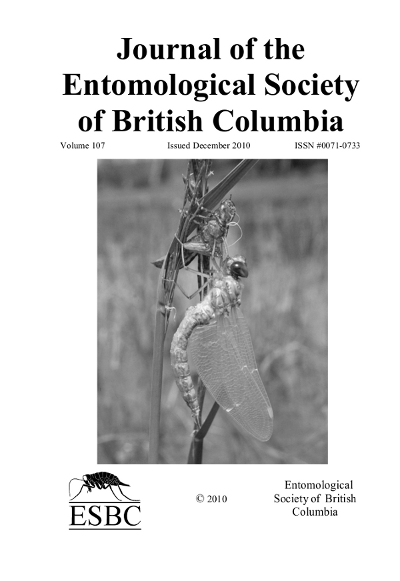 Given the large number of entomologists that call or have called the lower Fraser Valley home, it is reasonable to assume that the insect and spider fauna of the area should be reasonably well known. This discovery suggests that 1) either G. snohomish exists in localized, very restricted populations or 2) our knowledge of the natural history of the most heavily populated region of our province is less than we think. Text by Robb Bennett. COVER: An adult male Variable Darner (Aeshna interrupta) emerging on a Marsh Cinquefoil (Potentilla palustris) plant. The cast skin of the final-instar larva remains clinging to the plant above the dragonfly.The Variable Darner is one of the most common dragonflies in the rangeland ponds of the drier plateaus and valleys of southern British Columbia. Allover the province, it lives in sedgy ponds or lakes and, especially along the coast, around bog and fen pools. The common name comes from the shape of the lateral thoracic stripes of the male, which are usually very thin. These stripes are complete in most specimens from the Interior of the province, but are divided into spots (thus, interrupta) in coastal ones. The specimen was drawn by Rob Cannings. 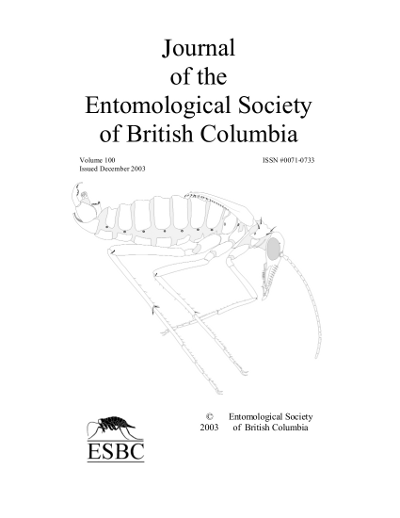 COVER: An erirrhine weevil, Grypidius leechi Cawthra (Coleoptera: Curculionidae). The adult is blackish brown and 5-6 nun long, excluding the rostrum. It has been found in Alberta, Colorado and Wyoming. The genus is holarctic and adults feed on aquatic plants including horsetails. The species was described by ESBC member, E.M. (Cawthra) Belton in 1957 from museum specimens lent by the British Museum of E.M. (Cawthra) Natural History and by the late ESBC member, Hugh B. Leech, then at the California Academy of Sciences, after whom it was named. The specimen was drawn by a third ESBC member, P. Belton.Reference: The Proceedings of the Royal Entomological Society of London. Series B, 26:127-130. 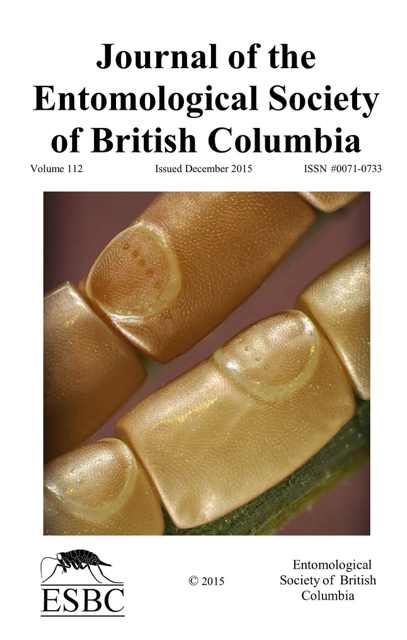 COVER: Sculptured pine borer, Chalcophora virginiensis (Drury) (Coleoptera: Buprestidae). Adults of this species reach 31 mm and as such are the largest of the western species of flatheaded borers. As their common name suggests, they have a uniquely sculptured dorsal surface. Their abdomen is equally remarkable with its beautiful iridescent bronze lustre, common in this family of insects. Larvae feed on dead and dying pine, fir and Douglas-fir. Pen and ink drawing by Laurie Friskie. Specimen caught near Kamloops, BC, by artist. 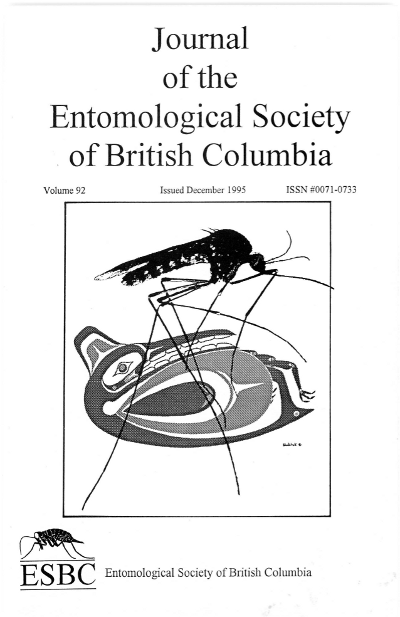 COVER: The symbol of the 1995 Annual General Meeting of the Entomological Societies of Canada and British Columbia is reproduced on this year's cover. It is from a limited edition print, Frozen Mosquito by BC native artist, Michael Blackstock. He was born in 1961 and is a status native with the Gitanmax Band in Hazelton, as well as a professional forester. He was inspired by the Tsimshian legend of the origin of the mosquito - in ancient times, blood sucking animals in human form used to invite travellers to their village and then drain their victims' blood by stabbing their long crystal noses into the necks of the unsuspecting travellers while they slept. One young man awoke in time to save himself. He fled from the village with the chief in hot pursuit. The chief tracked the young man to a lake where he had hidden in a tree on the shore. The chief exhausted and soaked himself trying to attack the man's reflection in the water and then, while recovering on the shore, froze solid. The young man and his people took the frozen chief and burned him to ashes. When the fire had burned out, a wind came up and blew the ashes into the air where they turned into clouds of mosquitoes. The photograph superimposed on the drawing was taken and scanned by the editor from a frozen female Culiseta incidens (Thomson) reared by David Onyabe. One of the Province's commonest and largest species; it is magnified 7.5 times.